Do you offer rush inventory? What are your awards and trophies made of? How to personalize an award or trophy? How to choose an appropriate award? What happens when we receive your order? When you place your award order on our secure website, you can shop with ease and confidence. Simply type in your personalization text under the award or trophy that you wish to purchase and click on the buy button. This item will be placed in your shopping cart. If you need to include logo or special artwork engraving, please place the logo set-up fee in your shopping cart as well. If you already placed an award order with us and your logo is on file, you do not need to pay for logo set-up again. When all the awards you wish to purchase are in your shopping cart, please proceed with the checkout process and complete the order on-line by following the prompts. We employ the highest security standards, which are PCI complaint and Network Solutions certified. All the credit card sensitive data is transmitted via secure protocol and encrypted by 128K encryption key. Your information is safe and secure. In addition we do NOT share customers information or personal data with any entities. Our friendly customer service associates will consider it a privilege to assist you with your on-line award or trophy order. Simply call our customer service number to answer any questions 1-800-506-7966. For customers who wish to place their award orders by fax we created the following order form. Simply print this order form, fill it out and fax it to us. Any personalization text or graphics associated with the faxed award order must be submitted via email. If you wish to personalize an award or a trophy with your logo, simply put the one-time logo set-up fee in your shopping cart while you are shopping on our secure website. After you complete the checkout process we will email you a confirmation of your order. Please reply back to our order confirmation email with an attachment of your logo or artwork file. If we already have your logo on file, do NOT pay for logo set-up and do NOT email it to us, our designers will locate it under your previous orders. 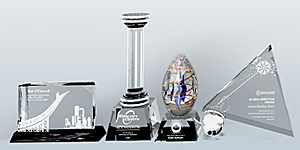 Corporate and organizational logos look beautiful when engraved on crystal awards and trophies. We recommend our customers to include their logos in their award and trophy projects. Our graphic designers are highly skilled in adapting designs to look best on crystal awards and trophies. When we receive your logo, they will work on a graphic proof. If however, you have the ability and wish to create your own artwork, please adhere to the following artwork guidelines. We do not engrave any awards or trophies unless a customer has reviewed and approved a graphic proof. All engraved crystal award and trophy orders have to go through a proof process. When our graphic artists receive your logo or artwork they immediately begin working on the graphic proof for your award and trophy project. They will create a pdf file where the crystal award or trophy is outlined on the background and the personalization copy appears in black on the foreground. Black areas of the proof will appear etched or frosted on the award. White areas on the proof will appear clear in the crystal award or trophy. We encourage customers to print and review the proofs as soon as possible as not to delay your order. Each order will receive two complimentary proofs. All additional subsequent proofs are billed at $15.00 per proof. It is customers responsibility to review their proofs with outpost attention and proof read for spelling and grammar mistakes. Our graphic designers do not automatically correct spelling or grammar mistakes typed by the customer. Once an award or a trophy is engraved, it is not possible to fix the spelling or grammar and re-engrave it. P lease remember that the engraving process is final. In order to optimize time, we begin award and trophy fabrication as soon customers place their orders. First we fabricate the award for engraving and it is done in parallel with the proof process. The last step of production is the engraving. We employ the highest quality crystal engraving procedure called deep etching or sand-blasting. By applying high pressure abrasive sand on to the crystal stencil we permanently create deep grooves on the smooth surfaces of crystal. This process is manual and requires outpost precision and mastership. However, sand-blasting also produces most rewarding results. In comparison, laser engraved crystal looks scratched and lacks precise lines and deep grooves. We engrave awards strictly per customers specifications. Only after we have a written approval upon customers proof will the engravers move forward with the deep etching process. Production and engraving typically take between 5-7 business days depending on production schedule, parts availability and order complexity. We can also execute rush orders, from 1-3 business days production. If you need to expedite your order please contact us at 1-800-506-7966. After the awards are created each one is inspected for quality and is carefully packaged in its presentation box. We take great care in packaging and ensuring that your awards and trophies will arrive safe. We use generous amounts of padding and packaging materials in each shipping box to avoid breakages. In addition, we insure each package with the shipping carrier. When it comes to packaging crystal awards and trophies are shipping team are the experts in the field. When the order is shipped we email customers a shipping notification with their tracking numbers, so customers can track and anticipate timely delivery. In the event you wish to use a custom font (not offered by Crystal Art USA) please indicate on your order and email/mail us the font you wish to use and your order number.